The US expressed “strong support” for the two Koreas’ plan to conduct a joint study to connect railways across their border, a top South Korean official said Wednesday, after the first meeting of a South Korea-US working group on North Korea issues. The US, however, reaffirmed its position that inter-Korean relations and the denuclearization of North Korea should progress in tandem, which analysts say shows Washington’s concerns over a potential difference with its ally. 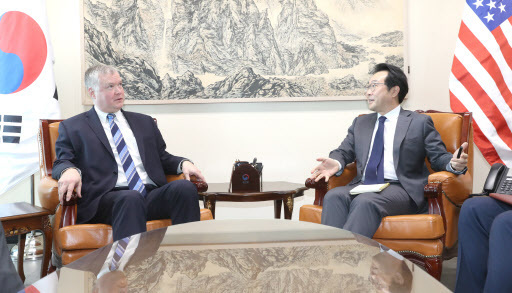 “The US expressed its strong support for the joint study of the inter-Korean railway project,” Lee Do-hoon, special representative for Korean Peninsula peace and security affairs, told reporters in Washington after meeting with his US counterpart, Stephen Biegun. Earlier in the day, Lee and Biegun held the inaugural session of the South Korea-US working group aimed at better coordinating the two countries’ North Korea policy amid a lack of progress in denuclearization talks between Washington and Pyongyang. “There has been progress through consultations with the US (on the inter-Korean railway project,)” a senior official from the Foreign Ministry said on condition of anonymity. “There only remain technical elements to be adjusted. The two Koreas agreed to conduct a joint inspection of cross-border railways, with the goal of holding a groundbreaking ceremony within the year, but the plan has been delayed, amid continued consultations between South Korea and the US over sanctions exemptions. In August, the US-led United Nations Command, which authorizes passage through the Military Demarcation Line, did not approve Seoul’s plan to test run a train across the border. It was interpreted as a sign of Washington’s objection to the project that could undermine international sanctions on the North. Lee said Seoul still aims to hold the ceremony by the end of the year. At the first meeting of the working group, Lee and Biegun discussed complete denuclearization of the Korean Peninsula and lasting peace, as well as the implementation of UN sanctions against the North and inter-Korean cooperation, Seoul’s Foreign Ministry said. The nuclear envoys also reaffirmed that the South Korea-US alliance is the linchpin of peace and security on the Korean Peninsula and in the region. Co-chaired by Lee and Biegun, the working group meeting will be held on a systematic and regular basis, according to the Foreign Ministry. The working group comprises government officials handling foreign affairs and inter-Korean issues, but its members could be changed flexibly according to agenda items, according to Lee. The launch of the working group came amid speculations of discord over the pace of inter-Korean developments between the allies. Seoul has sought to expand cross-border projects, which it believes will facilitate denuclearization, while Washington has been concerned that South Korea is moving too quickly with North Korea without tangible progress in the North’s denuclearization. Secretary of State Mike Pompeo said Tuesday the US has “made clear” to South Korea that progress on peace on the Korean Peninsula and denuclearization of North Korea should not lag behind the expansion of relations between the two Koreas. The working group is to ensure the allies do not “talk past each other” in their dealings with North Korea, he told the press conference.